"The origin of the name for Dale Hollow Lake is often misunderstood. 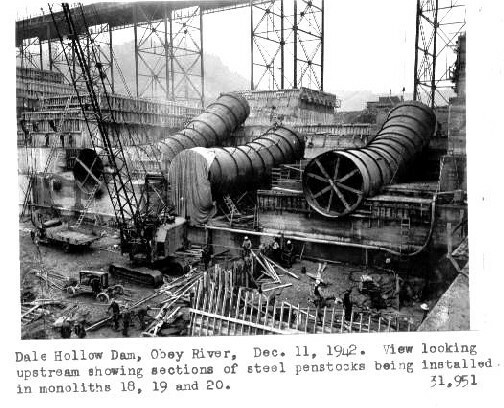 At the time of Dale Hollow Dam’s construction, the Corps of Engineers had the policy of naming dams for their location. Studies proved the best site for the dam was in the narrow point in the Obey River valley adjacent to the mount of the Dale Hollow on Obey River. Dale Hollow was a farm that had been a full-fledged plantation in ante bellum times. It was settled in 1808 by William Dale whose family and descendants lived there continuously until the dam was started in 1942. William Dale was a government surveyor who came to this area to assist in surveying the boundary line between Tennessee and Kentucky. William Dale was an associate of Moses Fisk. Mr. Dale met his wife-to-be when he sought shelter in the home of her father, Edward Irons, at Willow Grove. The Irons family was one of the five families who came overland down through the Cumberland Gap from New York Colony some time before the American Revolution. The families were: Irons, Barber, Stone, Hill and one other family whom some think was Mitchell. The families were able to live peacefully with the native Cherokee tribe because they bought their land from Chief Nettlecarrier, last of the Cherokee Chiefs in the region, and because they conducted themselves honorably, treating the natives with due respect and dealing fairly with them. William Dale married Rachael Irons and started his family at Willow Grove, moving to Dale Hollow in 1808 when he bought the first 449 acres of Dale Hollow from an early land developer named Samuel A. Martin. According to family legend, William Dale once owned title to all the land drained by Obey River. It is not clear who issued that title, possibly Chief Nettlecarrier, but at any rate the title was not honored by the government, and William Dale re-bought a portion of that land again. William Dale went from Dale Hollow to the War of 1812, taking part in the Battle of New Orleans. He heard Andrew Jackson give the command "Hold your fire until you see the whites of their eyes, then aim at the spot where their gallowses cross on their chest." William Dale was drowned in the Mississippi River when his flat boat overturned. According to family legend, William Dale was from Maryland, and was said to have been a gospel preacher. When Dale Hollow Lake was impounded, some well intentioned government employees approached the Secretary of State, Cordell Hull, and offered to change the name of Dale Hollow to Cordell Hull Lake, but Mr. Hull, a life long friend to the Dale descendants, said, "No, you have named it correctly already." Much has been written about Willow Grove, the town that drowned. There is a town in New York State named Willow Grove and some feel the original five families who settled there came from Willow Grove, New York, naming their new home in the wilderness for their hometown in New York. John Sevier, first Governor of Tennessee, mentions visiting the home of Edward Irons in 1799. That same year, Chief Nettlecarrier moved most of the tribe to Arkansas. A brother of Rachael Irons Dale died at the age of 18 and was buried on top of a shale hill where his grave was disturbed and his casket discovered in 1936 when the Willow Grove High school was built on the site. One early historian of this area stated that Willow Grove was the first permanent white settlement in the Upper Cumberland. At any rate the earliest citizens of Willow Grove left their mark on the land. Irons Creek still bears the name. John Hills descendants left a legacy by buying land and freeing slaves on the land still known as Free Hills." Permission to use this information was graciously given first of all by Andrea Burchard who publishes a free magazine entitled "Dale Hollow Visitor’s Guide" available in many businesses in this area, and by the Corps of Engineers’ office in Nashville, and I wish to thank both for allowing me to pass this along in my journal.